Newgrange (photo by Shira – for Wikipedia). The Newgrange passage-tomb is said to date from the Neolithic – around 3,300 to 3,200 BC, or according to some historians 2,500 BC, while the stone circle surrounding it ‘probably’ dates from about the same time, though some archaeologists have suggested 2,000 BC. The grassy, drum-shaped mound covering the chambered tomb is a staggering 250 feet (80) metres in diameter and 49 feet (15) metres high – originally it would have stood much higher than this, maybe up to 150 feet. Around the edge of the mound there are 97 large, revetted kerbstones, many displaying symbolic carved geometric designs: spirals, diamonds, lozengers, cup-and-ring and sun motifs, on all their faces. Author Rodney Castleden in his article ‘The Ring of Stone’ for ‘Exploring The Supernatural’ magazine says: “Can we claim this continuous wall of giant stones as a stone circle? Do we ignore it because it is the containing wall of a burial mound? “The mound consisted of a cairn of pebbles, with white quartz stones on the outer surface. The designs on the stones are probably symbolic, not just decorative, and the spirals may represent the maze of life. The passage-way leading into the tomb chamber is 60 foot (18.2 metres) long and is surrounded on all sides by large slab-stones, some of which are decorated with geometric symbols: triangles, chevrons and lozenges. This leads on into a cross-shaped chamber with massive stone basins that would have held offerings, or burials; above the chamber is a corbelled roof. No mortar was used, and the chamber is still waterproof – even after 5,000 years! But in fact there are three small chambers inside the mound. Author Cathal Coyle says that in order to construct this roof: “the builders overlapped layers of large rocks until the roof could be sealed with a capstone, six metres above the floor.” The corbelled roof contains the famous ‘triple spiral stone’ carved onto one of its stone slabs; the authors Janet & Colin Bord in (Ancient Mysteries of Britain) call these spiral-carved stones – ‘labyrinthine in concept’. “At dawn on the Winter solstice, the shortest day of the year and for a number of days before and after, a shaft of sunlight enters the chamber through an opening in the roof box and penetrates the passage, shining onto the floor of the inner chamber. The beam illuminates the inner chamber for just 17 minutes. To the Neolithic culture of the Boyne Valley, the winter solstice marked the start of the New Year – a sign of nature’s rebirth and promising renewed life to animals and humans” – (Coyle, 2015). “O’Kelley, who excavated the mound thought that some of the stones, missing from the circle, had been re-used in the ring of kerbstones, although he could not prove it. Maybe there was a change of plan and the Great Circle was never completed; there is a lot of uncertainty about the missing stones. “As far as we can tell this huge ring of stones at Newgrange, a hundred metres in diameter, is the earliest one of all. 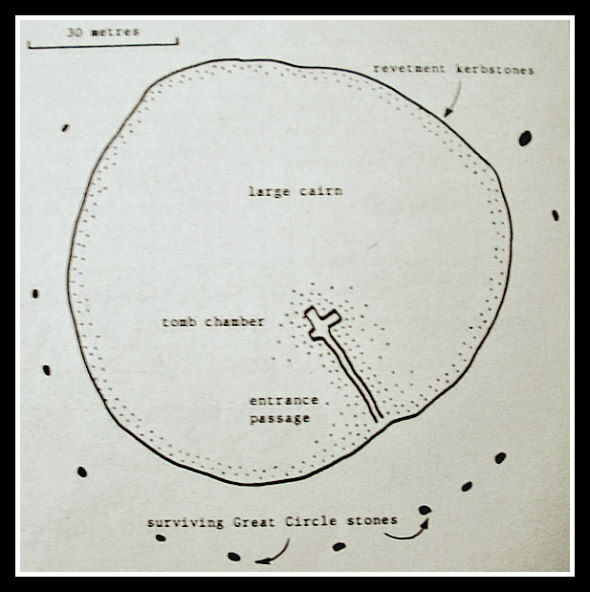 Most of them have not been radiocarbon dated, but from the evidence available the Newgrange Great Circle seems to be the ancestor of the British stone circles. 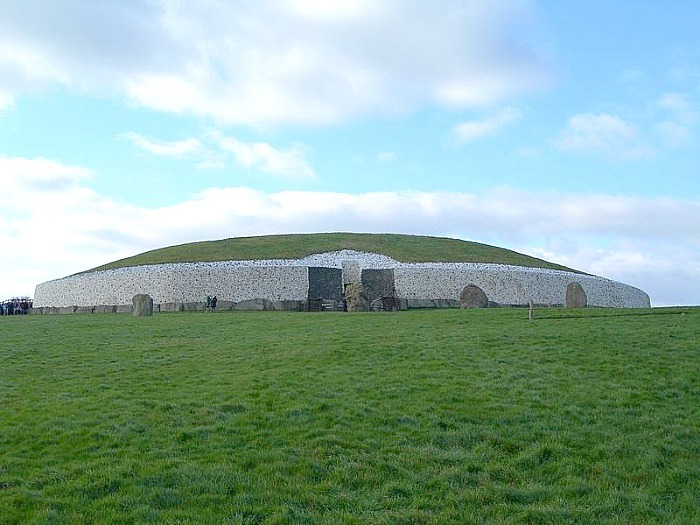 Author Cathal Coyle gives us more on the legends and myths of Newgrange. He say’s that: “According to the ancient mythology, the Tuatha Dé Danann (the People of the Goddess Danu, who according to tradition ruled Ireland before the coming of the Celts) were said to have built New-grange as a burial place for their chief, Dagda Mór, and his three sons. One of the sons, named Aonghus of the Brugh. It is believed that he was owner of the Brugh land, and that a smaller mound between Newgrange and the Boyne was owned by the Dagda. Newgrange (copyright Richard Gallagher 2003 – Wikipedia). 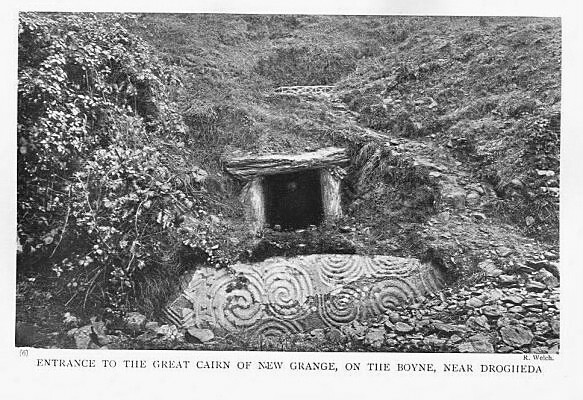 Cathal Coyle goes on to say that: “Newgrange was ‘re-discovered’ in 1699 by the removal of material for road building. The landowner, Charles Campbell, needed some stones and asked his workers to carry some stones away from the cairn. When those stones were moved, the entrance to the tomb was uncovered. An extensive archaeological excavation took place at Newgrange from 1962 until 1975, and the roof was was re-discovered in 1963.” And, says the author: “An interesting phenomenon associated with Newgrange is the discovery of Roman coins over the past four centuries. Many have been found at the site, the first recorded find of a coin was in 1699. These Roman coins were still being found in the 1960s when Newgrange was being excavated — some of them in mint condition. Whether they were buried here by native Irish worshippers or pilgrims from the Roman world, remains a mystery” – (Coyle, 2015). Ashe, Geoffrey., Mythology Of The British Isles, Methuen, London SW3, 1993. Bord, Janet & Colin., Mysterious Britain, Paladin Books, London W1X, 1984. Bord, Janet & Colin., Ancient Mysteries of Britain, Diamond Books, London, 1994. Castleden, Rodney., Ring of Stones – Part 1 Key To An Ancient World, Exploring The Supernatural, March 1987. Coyle, Cathal., Famous Landmarks, Ireland’s Own, Wexford, Ireland, (November, 2015, No 5,523 & various dates). https://en.wikipedia.org/wiki/Newgrange#/media/File:Newgrange.JPG Photo Credit: Shira∼commonswiki (Creative Commons 2.5 Attribution). https://en.wikipedia.org/wiki/Newgrange#/media/File:Newgrange_ireland_750px.jpg Photo credit: copyright Richard Gallagher 2003. Categories: Burial Chambers, Burial Mound, Stone Circle | Tags: Newgrange Passage-Tomb in Co. Meath in Southern Ireland | Permalink.